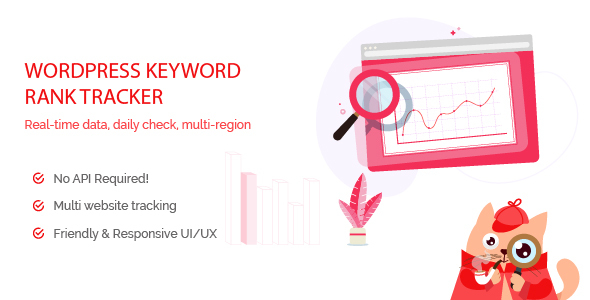 CP Keyword SEO Rank Tracker break the conventional rank trackers and bring you more benefits besides easy & real-time tracking . One-time payment, real-time data, daily tracking, multi-website tracking, multi-region check. Impress your client, additional value to your projects, SEO software for your marketing class. Tracking made easy with charts and keyword SEO performance. Centered data dashboard help you give better SEO & Marketing planning decisions. Save your time, save your money. All data is automatically updated on your demand. Just add keyword and Cat’s robots do the rest. International.Cat will track your ranking on multiple regions. Whatever country/region that Google support, Intl Cat will support, too! Instead of tracking your websites separately, Worker.Cat will check if your Youtube videos also ranked for the keyword, or your competitor?? Too many keywords? Filter the favourtied keywords with 10+ criterias and metrics. Wanna tell your client how their site is doing with SEO? Use Export function, save you tons of times, 2s to get the detailed repport, sounds great, right? Track your positions just like a PRO! Get the performance report on-demand by settings daily, weekly, monthly. Worries about Google update ranking algorithm or your keyword leave top 10? Sleep well with auto alert for in/out top pages. Easily have the detailed how well your keywork doing in post detail. Compatible to any post types! If you want to share the tracking info without accessing backend, then use the frontend report on Admin bar. Plugin is translated to Russian, Spanish, Portuguese, Bengali, Arabic and moeww to come! Yoast SEO, AIO SEO Pack, SEOPressor, WooCommerce, ooh oh, and any theme!!!!!. Moew! Do you know that CP Keyword SEO Rank Tracker is created by a featured author? Shhh! Don’t tell anyone that they put a lot, I mean hugeeee to every product they do, they will pet me, and I meowwww it! Get the backup with .zip file for your data, in case switching host. Use latest technology for the top-notch performance & experiences..
Pay one-time, use forever & get access to the lifetime updates! Do not worries your database size, it’s stored under JSON files! Restrict access to the specific user roles you want. Custom roles supported. Keyword researching is the first step of SEO, then optimize content and finalize is tracking keyword performance. Currently, we’re having alot of keyword tracking software or tools, but it’s expensive and do not have enough information to serve your marketing plan! So, we created WordPress Keyword SEO Tracker. Let’s say hello to the new keyword ranking tracker. CP SEO Keyword SEO Rank Tracker is a WordPress plugin to check rank of keyword on Google with your URL. You can keep following close on your keyword’s positions. CP SEO Keyword Tracker is an advanced WordPress plugin that let you to quickly and easily track the keyword in few clicks. The one of a kind feature that only CP SEO Keyword tracker is to check the rank of the keyword on many platform on Facebook, Youtube, and so on as long as your keyword is on there. Ranking graph will be generated for each keyword being tracked. Keyword tracker is not only a WordPress ranking tracker plugin but also penetrates each post to indicate the main keyword or making a list of keywords. You can export data on daily, monthly or even anually reports. It’s up to you. The plugin will let you know how ranking is going? Up or Down with rank change. Then leading to estimated visits. It also permits to dowload these reports as Excel. Anything changes on ranking of keyword, an auto email will be sent to you. Your will handle and solve the problem on time. In addiion, CP SEO Keyword Tracker will send you a daily email with each position transition up or down. CP SEO Keyword Tracker is light: To save your database, you can save the information wherever you want. So the plugin will run at ease. CP SEO Keyword Tracker is super easy to use. It is a sleek SEO plugin that is built for online marketer, SEO manager and so on. No matter you are a professional user or beginner, you can use CP SEO Keyword Tracker comfortably. The estimated visits let you know how many traffic you will get. With the detail stats, it is easy to monitor and evaluate your tactic. Does it work well? Is there anything to adjust to go on the right track?